With tensions rising between two Near Space civilizations, the a host of historical sites are at risk of being caught in the ensuing conflict's crossfire. 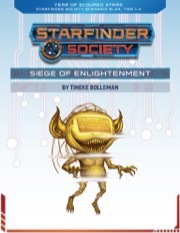 The Starfinder Society's been called in to catalogue one such site, believed to be the ruins of a now-defunct hobgoblin empire that may have ended during the Gap. 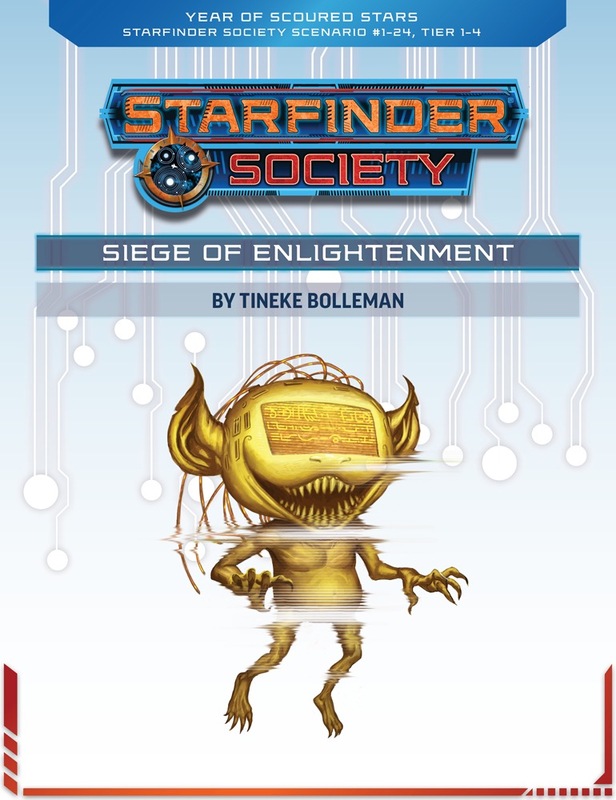 Speeding into the distant star system, the PCs must navigate the politics of the escalating conflict and reach their target. All in all, this would have made a decent PFS dungeon crawl. That being said, it was not what I was at all expecting with how the 3 sentence blurb about the scenario was going on about politics and such. And me bringing a diplomatic operative…..not as much fun as it could have been. For people who love combat (space or otherwise) this was a good scenario. It had a few new rules/mechanics in the space combat that I actually thought was great. Now for the full review….there be spoilers ahead. I won’t exactly call it a political scenario. There was literally no politic/diplomacy involved. Sorry…the only real politics was the 'oh you are in our “space territory", prepared to be boarded or destroyed'. And if you beat the enemy vessel the 'oh, you won, but we will be back' trope. I would honestly give it a lower ranking on story (probably a true 2), but I did like the bit about the previous empire that the ruins we were exploring. Too bad that by the time that started to get interested, I realized that it was a “standard” dungeon crawl. I give this above markings due to the background about the previous empire. Though the only reason we knew this was thanks to one PC luckily having the correct language, along with a lot of very high perception and/or computers checks. As I mentioned in Story above, I did like the background information and the little we figured out about the 2 warring star systems. Only RP I felt was the initial Venture Captain data dump about the mission, and the very little with the on planet mechanic. And with the GM running it—who I probably consider one of the top 5 GM’s I have played with in years—doing the best he could, this still only hit a 1. There was no real dialog with any of the “baddies” either in the hanger, or in the ruins. If I could do it, I would probably give this a 6 out of 5 because of the amount of combats. 1 Ship combat, 1 “puzzle” combat, 2 “normal” combats and a boss fight. That is a LOT to put in a 4-5 hour game session. People have said this runs long…and it does. Out of all the fights, I would consider the ship combat and the puzzle combat being the highlights. Big Spoilers….photon stress bands + an enemy ship that rams=AWESOME. And the computer gremlins….that was fun. The rest I could have done without. The whole ruin area, if it wasn’t looking around, it was combat. And as I mentioned, it could have been a PFS dungeon crawl in feel. I signed up to play this scenario on the basis of the short description, which led me to believe that this would be in the vein of Yesteryear's Truth and The Protectorate Petition. I brought a diplomat-build Envoy to the party specifically due to the scenario's description. Now having played it, I feel the victim of a bait and switch. For what it is, the scenario is perfectly serviceable, and I did appreciate that there were contextual clues to explain how certain entities came to be where they were when we encountered them. Also, there were some additions to the space combat encounter that helped to break up the usual monotony, which was enjoyed by our group of players. So I give praise to the writer on these points and am rating it 3 stars on this basis. The politics covered in the initial briefing have no real bearing on the rest of the scenario at all, unless you wish to count that one side of the conflict actively tries to shoot your ship down when approaching the planet to which the party was dispatched. The PCs could have slept through the briefing and missed nothing that directly pertained to the events after that. The second half of the scenario was indistinguishable from a standard Pathfinder dungeon crawl. For those like me who enjoy in-character interactive role-playing and defusing tensions with negotiations and diplomacy over combat, this scenario will likely be a disappointment. Those who enjoy more combat-heavy encounters will likely find it more entertaining than I did. This scenario is pretty straight forward. You're tasked with helping some folks in need and exploring some Pre-Gap ruins while you're in the area. There's some cool space politics going on in this one, but it's mostly behind the scenes or background context. A bit unfortunate, since I rather like that sort of thing. Haha. On the plus side you get to interact with both sides of a conflict, and learn a bit about them both. There's some interesting characters introduced in this scenario, but roleplaying with such characters will be quite brief. Having a few characters trained in Computers and Engineering on your team is very important, and that such characters with have the opportunity to do something special during parts of the adventure. On a similar note, scholarly and studious characters — particularly those interested in archaeology, cartography, chronicling, history, and scribing — will also find opportunity to showcase their interests in this scenario. During the initial starship battle there’s a new starship ability introduced which I think is awesome! The first physical combat is very interesting and should be a lot of fun at the table, but it’s very complex, so GMs will need to familiarize themselves with it thoroughly before attempting to run the battle. Despite the complexity (and the very dense map), I think it’s a hoot! In the ruins there’s the addition of a simple new mechanic called Discovery Points, which are meant to track how much your players discover and catalogue about the ruins, without bogging down gameplay too much. Although such tracking will all happen on the GM side of the screen, I think it’s wonderful that your player’s thoroughness will be rewarded. It is supposed to be an archaeological investigation, after all. This scenario is very combat heavy! Like, REALLY combat heavy. It contains one starship battle, four other combats, two traps, plus one of those listed combats is likely to also contain at least two hazards and traps (possibly more). That’s a LOT. Too many, in my opinion. A very fun scenario, with a lot of flavor! The space combat was quite nice, with a cool twist to the movement. Some scary combat later on, mixed up with fun goals to reach (we failed!) and cool PCs, and discovering some new races. Thurston, are you able to share anything on maps for this one and 1-25? Thanks! I see we got an answer from John on maps for 1-25. Any word on maps for this one? This is Tineke's new scenario? Color me hyped! I'm told from the blog post we'll have hobgoblins in this one. So I assume they'll be a lot of shooty, shooty bang bang. I liked the rest of the scenario. But once again just like every Starhsip Combat since the special the players took no hull damage and any shield damage was repaired within one round. Starship combat at this challenge level is a stupid waste of everyone's time. It's like giving the entire party a 30 AC and have them walk around a tier 1-2 dungeon.